Varied presentation of similar entity in two different temporal settings. Department of Trauma & Orthopaedic, University Hospital of South Manchester NHS Foundation Trust, Manchester, M23 9LT, United Kingdom. Introduction: The calcific tendinitis is a common to happen around the shoulder, calcific tendinitis of tendons adjacent to the hip is not common like the shoulder. It can present either as acute hip pain and limitation of movement or chronic hip pain. We present two patients one with acute presentation and the other one chronic. Case Report: We present a case series of two patients with calcific tendinitis of the gluteus medius muscle. One patient a 37-year-old male presented with acute severe hip pain associated with a raised temperature, prompting concern about septic arthritis. The second patient presented with chronic hip pain. Calcification of the soft tissues adjacent to the greater trochanter was evident on plain radiographs in both patients. CT and MRI scans excluded septic or inflammatory arthritis in the patient with an acute presentation, the patient’s condition settled with analgesia and NSAIDs. Conclusion: An unusual combination of symptoms and finding mimicking septic arthritis should be considered in patients presenting with acute calcific tendinitis of the hip gluteus medius muscle. Keywords: Calcific tendinitis. Gluteus medius. Septic arthritis. Calcific tendinitis is caused by the deposit of calcium hydroxyapatite crystals in periarticular muscle attachments . It has been reported at different anatomical sites, most commonly around the shoulder, Achilles, quadriceps, gastrocnemius and adductor tendons . Calcification with trochanteric bursitis is well described, while gluteus medius calcific tendinitis is an uncommon and sporadically reported clinical condition . Clinically, it usually presents with pain and tenderness around the hip, with limitation of movement. 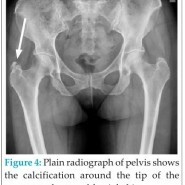 Many patients with calcification around the hip present with chronic hip pain . The treatment usually involves analgesia, non-steroidal anti-inflammatory drugs and local steroid injections. For chronic cases, arthroscopic surgery is recommended and acupuncture with small scalpel needling can help to treat the calcific tendinitis of the gluteus medius, as was recently reported . We report the cases of two patients who presented in different ways. The first one presented with an acute presentation mimicking septic arthritis, and the second patient presented with chronic lateral hip pain. A 37-year-old man presented with a two-day history of acute, severe lateral side pain in his left hip, which radiated to the thigh. There was no history of trauma or any unusual activity prior to the onset. On examination, he was unable to bear weight, was pyrexial with temperature of 38 ͦC, and had extreme tenderness over the greater trochanter. Hip movements were painful, restricted and essentially impossible. There were no other sources of sepsis found upon clinical examination. Blood tests revealed leucocytosis of 11900/µl and increased inflammatory markers, with a C-reactive protein level of 239 mg/l. His bone profile and serum urate level were within normal limits. Plain radiographs of the pelvis showed calcification adjacent to the greater trochanter (Fig. 1). Aspiration of the left hip joint was attempted, although it was a dry tap. The painful area adjacent to the greater trochanter was injected with 10ml of 0.5% Bupivacaine and 40mg of Depomedrone and which provided instant relief of his symptoms. 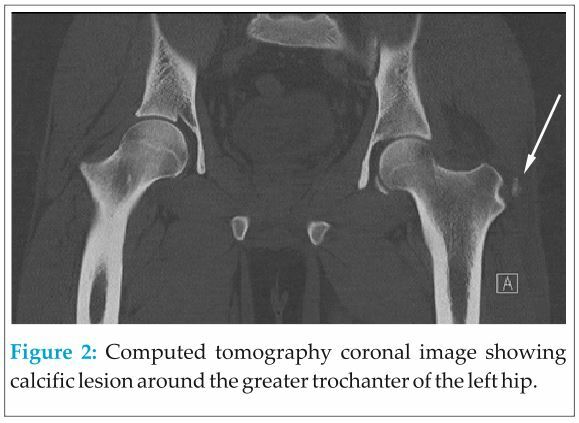 A CT scan confirmed calcification around the greater trochanter area of the left Hip, with no effusion in the hip joint (Fig 2). A magnetic resonance imaging (MRI) scan of the pelvis showed calcification within the gluteus medius tendon and oedematous changes in the surrounding tissue and bone marrow. There was no evidence of osteomyelitis (Figs. 3a and 3b). 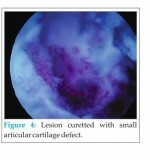 Septic arthritis was ruled out, and the patient was treated with non-steroidal, anti-inflammatory drugs and analgesia. No antibiotics were given. The pain eased off gradually, and his temperature returned to normal within two days. Inflammatory markers returned to normal after two weeks. The patient was able to start mobilising and was pain free after three weeks. A 51-year-old woman presented with over a six month history of lateral hip pain on the right side. This pain was resistant to simple analgesics. Her past medical history included multiple sclerosis and calcific tendinitis in the shoulder. She was mobile indoors with support and used a mobility scooter when outdoors. Upon examination, there was tenderness around greater trochanter area of the right hip. Hip movements were restricted due to the pain. 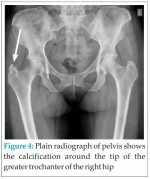 Plain radiographs of the pelvis showed calcification around the tip of the greater trochanter of the right hip (Fig. 4). An injection of steroids and local anaesthetic into the painful area resulted in complete resolution of her symptoms. Calcific tendinitis around the hip has been reported sporadically . It is the second most common joint that is affected by calcified deposits . Calcification adjacent to the greater trochanter has been well described and reported in the literature , and it was radiologically evident in plain radiographs in approximately 40% of patients with trochanteric bursitis . The calcified deposits around the hip were reported in different sites: in bursae between the gluteus medius and greater trochanter, in the area underneath the gluteus medius tendon, in the greater trochanter bursa with trochanteric bursitis, in the reflected head of the rectus femoris tendon, and in the gluteus medius tendon . In many cases the calcification may be asymptomatic, although calcific tendinitis can be an important cause of severe pain . Calcific tendinitis of the gluteus medius usually presents with pain or tenderness around the greater trochanter. Hip movements may be limited. Fever, local oedema and raised inflammatory markers may be present . Calcific tendinitis can be either acute or chronic, depending on the duration and mode of presentation. Acute calcific tendinitis usually lasts less than two weeks . The chronic type usually dissipates without any need for surgical intervention, although Kandemir et al suggested endoscopic treatment for chronic gluteus medius calcific tendinitis . 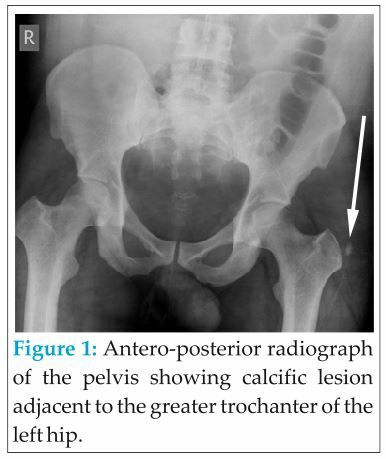 The abrupt onset of the calcific tendinitis can mimic hip infections, metastatic diseases or fractures, which are usually diagnosed based on clinical suspicion, followed by plain radiograph of the hip. If there is concern about infection or metastatic disease or the case difficult to diagnose, then a CT or MRI scan is recommended . Calcific tendinitis usually is a self-limiting condition; however, symptomatic treatment includes analgesia, NSAIDs, local steroid, rest and physiotherapy. Invasive treatment involves local steroid injections and arthroscopic debridement, which is recommended for cases in which conservative treatments failed . An MRI scan can exclude the infection and confirmed the diagnosis of calcific tendinitis. An MRI scan is recommended as a useful tool to exclude other causes of hip pain. In our case study, we observed two different modes of presentation of calcific tendinitis of the gluteus medius. Acute calcific tendinitis of the gluteus medius should be considered in the differential diagnosis of patients with an acute presentation mimicking septic arthritis. An MRI scan excluded the infection and confirmed the diagnosis of calcific tendinitis. An MRI scan is recommended as a useful tool to exclude other causes of hip pain. Diagnosing acute hip pain can be challenging. Calcific tendinitis of the gluteus medius is one of the causes of acute hip pain and can mimic the presentation of septic arthritis. 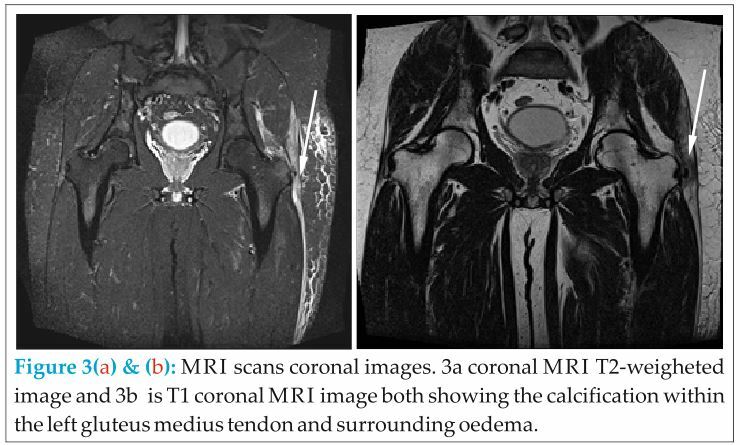 An MRI is recommended as useful tool to exclude infection and confirm calcific tendinitis. 1. 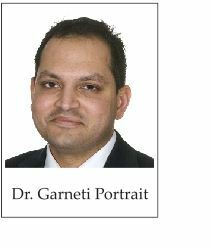 Kandemir U, Bharam S, Philippon M, Freddie H. Endoscopic treatment of calcific tendinitis of gluteus medius and minimus. Arthroscopy 2003;19(1):1-4. 2. Yang I, Hayes C, Biermann J. . Calcific tendinitis of the gluteus medius tendon with bone marrow edema mimicking metastatic disease. . Skeletal radiology 2002;31:359-361. 3. Pereira E, Brown R, Resnick D. Prevalence and patterns of tendon calcifi cation in patients with chondrocalcinosis of the knee: radiologic study of 156 patients. . Clinical imaging 1998;22:371-375. 4. 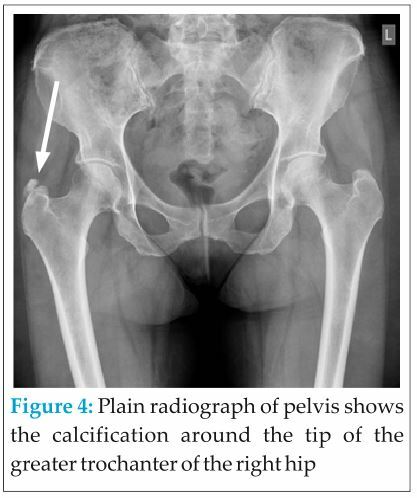 Jones G. Acute episodes with calcification around the hip joint . J Bone Joint Surg 1955;37:448-452. 5. Lin W, Liu C, Tang C, Hsu C. Acupuncture and small scalpel therapy in the treatment of calcifying tendonitis of the gluteus medius: a case report. . Acupuncture in Medicine 2012;30(2):142-143. 6. Saki T, Shimaoka Y, Sugimoto M. Acute calcific tendinitis of gluteus medius: a case report of serial magenetic resounance imaging findings. . Journal of orthopaedic science 2004;9:404-407. 7. Siegal DS, Wu JS, Joel S. Newman, Joel S., del Cura JL, Hochman MG. Calcific Tendinitis: A Pictorial Review, Canadian Association of Radiologists Journal 2009;60(5):263-272. 8. LeCocq E. Peritrochanteric bursitis: report of a case. . J Bone Joint Surg 1931;13:872-873. 9. Schapira D, Nahir M, Scharf Y. Trochanteric bursitis: a common clinical problem. Arch Phys Med Rehabil 1986;67:815-817. 10. SARKAR J, HADDAD F, CREAN S, BROOKS P. Acute calcific tendinitis of the rectus femoris . J Bone Joint Surg Br 1996;78:814-816. 11. Bosworth B. Calcium deposits in the shoulder and subacromial bursitis: a survey of 12,122 shoulders . JAMA 1941;116(22):2477-2482. 12. Chow H, Recht M, Schils J, Calabrese L. Acute calcific tendinitis of the hip. Case report with magnetic resonance imaging findings. . Arthritis Rheumatisim 1997;40:974-977. October 29, 2014 Fracture of Uncemented Revision Femoral Stems in three Arthroplasty Patients: A Case Series with three different brands.